The time required to look, decipher and respond is important when observing all mediums in art. There is a need to allot a specified amount of minutes to view video art. And with the speedy way in which contemporary life is lived more often than not viewing art seems relegated to the cursory glance which does not bode well for the video. Having said that it is often more readily embraced by those tattooed youngsters that appear cooler than their older counterparts. Maybe they “get it” having been raised on a diet of continually improving technology. But it’s worth slowing down to check out the “New To Video” exhibition at Newcastle Regional Gallery until 27th April. Two video artists in particular capture attention. One being artist Todd Fuller with One and Only 2012 and the other being artist Sarah Smuts Kennedy with Another Day in Paradise 2009. 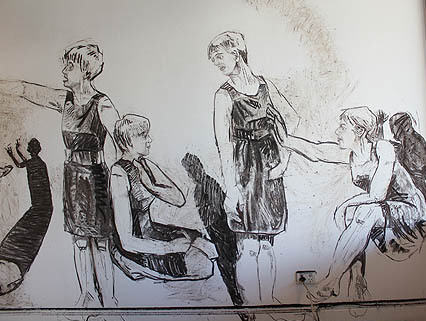 Fuller uses gallery wall space to create drawings in charcoal, filming these drawings than erasing them to produce an elongated story. The premise is akin to the animated works of South African artist William Kentridge who’s beautifully executed charcoal stills are rubbed and erased to produce message and meaning. Perhaps the reason Fuller’s video tempts the traditional viewer is due to the witnessing of a tangible skill in action, drawing being the real genesis of the video. But despite this there is beauty through melancholy in the journey of the fluttering heart, searching for a place to flourish that is the essence of the short story. New Zealand artist Sarah Smuts Kennedy produces a peculiar video. There is nostalgia in the disjointed jerky movement of a digital video on infinite loop. The hazy perimeter is intentionally artificial designed to inspire wistful reflection. A passing parade of unaffected humanity provokes thoughts on our temporary fleeting moment, quickly passed and quickly forgotten. Time is needed to watch and absorb these videos otherwise a swift glance becomes relegated to those all too common moments of waste where the rush rush has no meaning. For myself a second viewing is mandatory.